So I have been home today, nursing a low-grade migraine and knee pain from the weather we’ve been having. I was trying to sleep, curled up on the couch with the cats, when I realized something — I couldn’t sleep because I was absolutely ravenous. We are out of bread, so no toast for me. I was tired of cheese and crackers as a means of “tiding me over” till I could eat properly. I needed something fast and easy. “Soup!” I thought and wandered over to the pantry. Now, anyone who knows me knows that I’m not a fan of canned soups. Either they’re too salty or too bland or they taste “tinny” or the texture of the objects in the broth are just wrong… So why was I even considering soup? I recalled that Campbell’s Cheddar Soup was on sale a while ago and we bought something like a dozen cans just to have it in stock for me. I love it as a base to carry other dishes. I never eat this stuff straight up, always opting to add other flavours to it to jazz it up. Each batch of “cheddar soup” is completely different than the last. Turning the can over in my hand, I realized, I don’t actually want soup. But something caught my eye: a recipe on the side of the label! It was for a recipe just called “Mac & Cheese”. I called for ground beef, beef broth, water, uncooked pasta, salsa and the can of cheddar soup. I could see where they were going with this and it sounded tasty, but the problem was that I wasn’t quite feeling like having anything Mexican-themed (read: salsa) and I had no broth whatsoever. I was even out of Oxxo packets! In my wok (I like using it because it’s deep), I browned the meat and onions in a bit of the water, H1 sauce, Diana sauce, soy sauce, gravy mix & Worchestershire. I then added the rest of the water, the juice from the can of tomatoes and brought just to a boil. Lowering the heat a bit, I added the noodles, stirred the mixture well, then covered the wok and cooked for about 8 minutes or until the noodles were about al dente, stirring a few times to prevent sticking to the bottom and allow even cooking. Then the lid came off and I added the frozen peas and half of the can of tomatoes, basil, garlic powder, salt and pepper, stirring to mix through. Once these were just cooked through but not mushy, I added the can of cheddar soup and continued to stir and mix, thoroughly blending everything. It thickened while I stirred it. Now, I was truly expecting a large cheddar flavour profile in this, but surprisingly, it took the back seat. The soup added a beautiful creaminess and the beef and tomato flavours really shone through. The peas offered a nice little “pop” in the mouth. But despite the soup in the dish, I couldn’t pick out anything that screamed “cheddar!” at me and in fact, it reminded me a lot of the Hamburger Helper Stroganoff mix we used to buy years ago. And yet there is no sour cream in this mixture, but the creaminess of the soup must have been enough! Over all, it was warm and comforting. Just what the doctor ordered! So I’ve polished off a bowl between sentences and am feeling much better, though my head is still nagging at me. I think I’m going to have a bit of water, then go and lie down again and maybe, just maybe, I’ll be able to sleep this time. 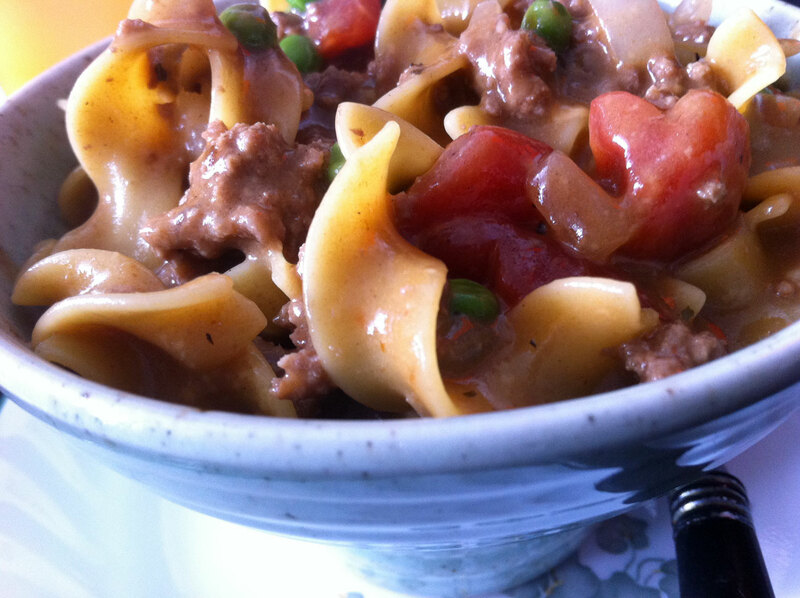 This entry was posted in altered recipes, dinner, Lunch and tagged cheddar soup, diana sauce, ground beef, h1 sauce, noodles, onion, peas, stove-top, tomatoes. Bookmark the permalink.